Dawn is a NASA mission to journey to the two oldest and most massive objects in the asteoid belt, astreoid 4 Vesta and dwarf planet 1 Ceres. Dawn will be the first purely scientific mission to be powered by ion propulsion, an advanced technology successfully demonstrated by NASA's Deep Space 1 mission. The use of solar electric ion thrusters will enable Dawn to orbit both asteroids in one mission, a feat that has not been attempted before. Planned originally for launch in May 2006, Dawn was to reach, after a Mars fly-by, 4 Vesta in 2010 and 1 Ceres in 2014. In late 2005, the Dawn mission was delayed to a 2007 launch date instead of the planned June 2006 launch, due to ongoing concerns of the ion engines. A Laser Altimeter and a Magnetometer were dropped from the sensor suite during development. 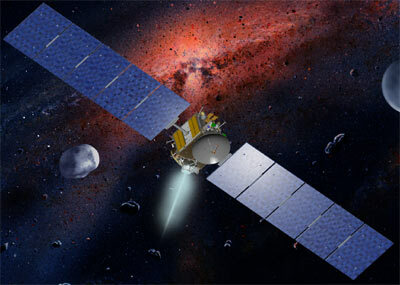 Dawn has been cancelled in February 2006, when the spacecraft was nearly completed. On March, 27th 2006, Dawn was reinstated for a launch in 2007. After launching in 2007, the Dawn spacecraft reached its first target, the asteroid Vesta in the main belt of asteroids between Mars and Jupiter, in July 2011. After spending 14 months surveying Vesta, Dawn was prepared to depart for Ceres in 2012, with two reaction wheels had suffered crippling malfunctions. In March 2015, Dawn entered an orbit around Ceres. The mission ended on 1 November 2018, when the probe ran out of fuel after it had been put into an orbit around Ceres stable for at least some decades to avoid contamination of the surface.